In addition to being an incredibly important time in American history, the Civil War era also calls up some specific looks when it comes to costumes. The key to creating an authentic look at home is to use Civil War costume patterns and work to ensure you cover all the details. The United States War Department standardized the uniform for Union soldiers in 1861 to make it easier to tell the two sides apart. The standard Union uniform consisted of a dark blue wool jacket with four brass buttons, light blue wool trousers, a "blouse" or lined shirt, and a cap. 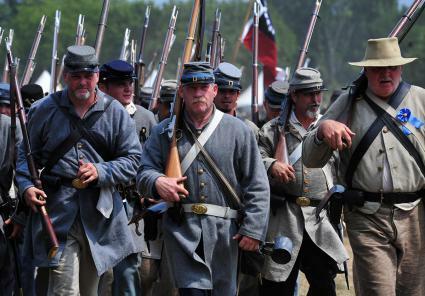 In contrast, the Confederate Army Uniform was made up of a gray coat and gray trousers and a cap. If you're making the costume yourself, it's important to use a good pattern to help. McCall's has a four-dollar pattern for a Civil War Coat and Trousers, which you can modify based on the side of the soldier. You can also choose a coat style to signify an officer or keep it simple for a regular soldier. You'll need previous sewing experience, but you don't need to be an expert. Uniforms were made from lightweight wool, designed to wear well in the field. You can find lightweight wool fabric in blue or gray for about $20 per yard on Fabric.com or at your local fabric store. Choose 100% wool for authenticity, or if you're on a budget, a wool blend will give you the look of wool without the cost. Buttons are an important part of any uniform costume, whether you're planning to have your solider be part of the Confederate or the Union Army. You can use ordinary buttons from the fabric store, but there are specialty buttons for a really authentic look. C&C Sutlery offers brass buttons for both sides, as well as officers, for about $1.50 each. The hat worn by soldiers, called a "forage cap," can be a challenge to make. If you need several, you can purchase a forage cap pattern on Etsy for about $15 and make it in fabric to match the rest of the uniform. 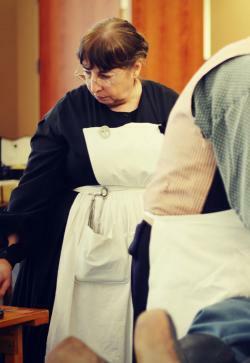 Women had an important role in the Civil War, serving as nurses, laundresses, and cooks. They also sewed uniforms and prepared bandages, and back at home, many women provided essential emotional support. The appropriate costume for a woman will depend a great deal on her role in the conflict, but these tips can help you create the perfect look. 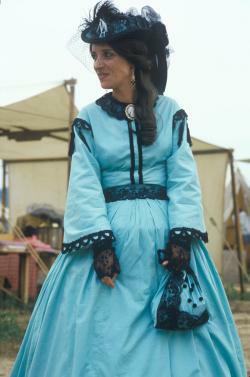 For civilian women, the traditional bell-shaped dress of the 1860s is the perfect choice. Use Past Patterns' design of a gathered or pleated bodice and skirt to make an authentic reproduction. These even have dropped shoulders, which were fashionable at the time. The patterns for the skirt and bodice retail for about $14 each and require some previous sewing experience. Nurses during the Civil War wore plain black or brown dresses and large, white aprons. You can create the civilian-style dress in plain brown or black fabric and add a pattern for a simple pinner apron, available for about $12. Make the apron in white cotton. At this time in history, women wore hoop skirts to hold the skirt out from the waist, although in the field, they often relied on several petticoats for easier movement. If you choose to use a hoop skirt as part of the costume, pick one that is adjustable, such as the $30 five-bone hoop skirt from Amazon. That way, you can make sure it provides exactly the desired amount of support for the skirt. For authenticity, stick to natural materials like silk, cotton, and linen. You can buy period-appropriate fabrics at a specialty retailer like Originals by Kay or at your local fabric store. Look for muted colors and small patterns. 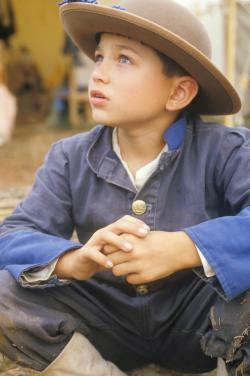 During the Civil War era, kids also had specific clothing that represented the era. Girls wore dresses and even hoop skirts, and boys wore coats and trousers. 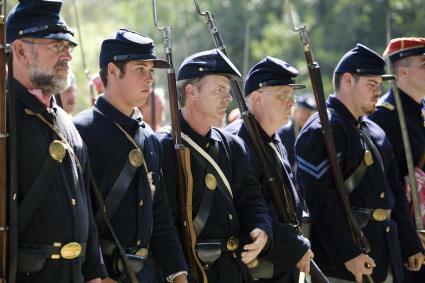 Some boys even wore uniforms, since the Confederacy did not have a minimum enlistment age and boys of the Union sometimes lied about their age to enlist. 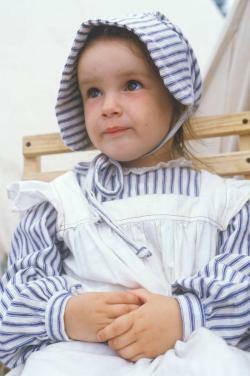 Any pattern from about 1860-1865 can serve as a basis for a child's Civil War-era costume. Amazon Drygoods has a good selection of clothing patterns for kids, including boys' coats and trousers and girls' dresses. Most retail for about $10 to $15 and require some previous sewing experience. To make a uniform for a boy solider, use a standard coat and trousers pattern, and make it in blue or gray wool. Add brass buttons and a cap to complete the uniform. 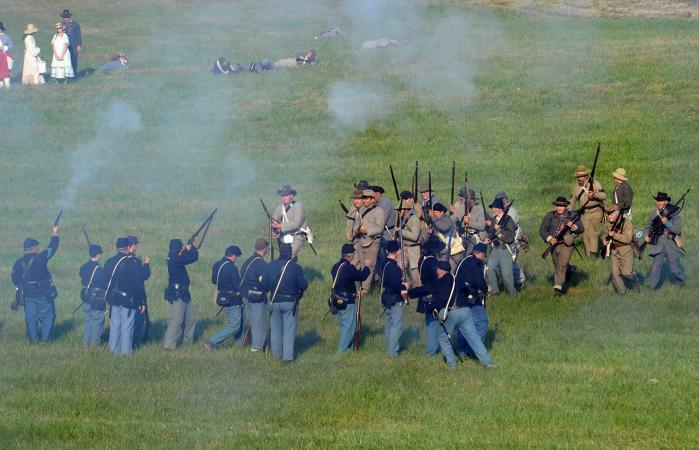 Whether you're making a costume for a child to wear in a play or a completely authentic outfit for a reenactment, making Civil War costumes requires research and a good pattern. Take your time planning the outfit ahead of time to ensure you are totally happy with the period look you create.